You have reached this page because you wish to upgrade your membership, you simply are just not logged in, or you clicked on content that isn’t included in your membership. If it’s the latter, don’t worry! You can upgrade your membership at ANY TIME by calling the office at (888) 528-4451. Includes ALL Live Workshops in Las Vegas, NV! If you are seriously dedicated to connecting with your audiences and want to start learning advanced techniques from anywhere in the world, this membership is designed for you. As a Presentation Mastery Member, you will get access to any new program we create. You also get a 25% discount on any of our LIVE Events. You can also upgrade to Platinum Membership at any time. Get access to $3,355 worth of content at $47 per month, cancel anytime. Are you seriously dedicated to building your speaking business? Get connected to two professional speakers who will show you how to get your business going. In addition to connecting with your audiences and want to start learning advanced techniques from anywhere in the world, this membership is designed for you. As a Business Mastery Member. Get instant-access to $5,440 worth of content at $77per month. You also get a 25% discount on any of our LIVE Master Workshops. If you are all in and completely committed to your professional transformation, this membership was designed for you. In addition to instant access to all of the online fast start and master programs, you also get free registration to all Stage Time University LIVE Events. They are included in your Platinum Membership, no extra charge.Additionally, you receive a monthly group Mastermind call with Darren. You will also get access to any new programs and new live events included in your membership. Get access to $22,468 worth of content for only $397 per month. Admission to all live events (No extra charge) Attend 5 events and it will pay for itself. Anyone can try to be amazing, but people who are the best train to be amazing. True professionals get trained. They know that no one becomes great alone. The best professional presenters seek out the best teachers and coaches. Congratulations! You just found them. You can learn secrets directly from some of the best speakers and coaches in the world. 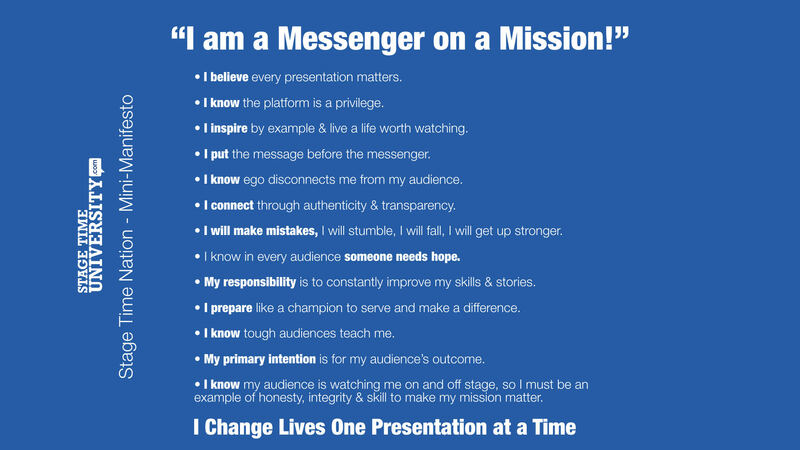 To help each other master our messages and create unforgettable stories; to plant seeds of hope in the hearts of our audience so that we can change the world one presentation at a time. Together we are merchants of hope. Darren has assembled a faculty of the best coaches in the world who teach from real-life, stage time experience, have the intent to help you, and have fun doing it. Why? Because they love what they do. Our Mini Manifesto. We have the right to refuse service to anyone for any reason. We may cancel your membership for any reason without issuing a refund.